Until we get solid proof, like a dead body that is authenticated by DNA, the answer will remain shrouded in mystery. But adding to the intrigue to the "Is Bigfoot real?" debate comes the Nacogdoches Auction in Nacogdoches, Texas, where Bigfoot hair was auctioned off for $225. Is the Bigfoot hair real? Steve Busti, owner of the Museum of the Weird in Austin, Texas, and winner of the auction, intends to find out. He plans to have DNA testing performed on the "Bigfoot hair." "I'm excited," Busti said told GrindTV Outdoor. "I'm really looking forward to having the hair tested. If they come back with some unusual result, it could really change things. This could really be like the smoking gun, if you will, that will prove the existence of this animal." Ty Shafer of Lufkin, Texas, is convinced the hair is authentic. After hearing how the Bigfoot hair was obtained, Shafer bought a lock of the hair for $15 on the Internet and subsequently put it up for auction over the weekend. 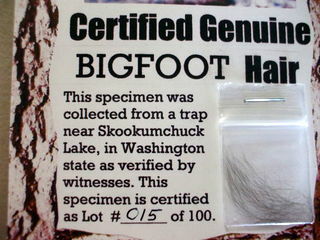 Shafer said the seller of the Bigfoot hair had visited a friend in the state of Washington. It was around Skookumchuck Lake where the hair was discovered near some animal traps (not Bigfoot traps). Not only did the man say the hair belonged to Bigfoot, he claimed to have seen Bigfoot. Interestingly, according to The Bigfoot Field Researchers Organization, there have been 16 Bigfoot encounters in Thurston County, in which Skookumchuck Lake is located. Bigfoot researcher Henner Fahrenbach dismissed the hair that was sold at the auction, saying it was a rip-off because all previously discovered Bigfoot hair samples, about 20 in all, are single strands of hair, not locks of hair. 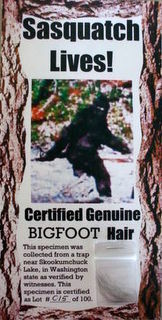 Nevertheless, Busti is keeping an open mind, knowing the odds that the Bigfoot hair he bought is authentic are slim, or as he put it, "probably a very, very low probability." "But at the same time," he added, "it's those chances we've got to take to try to find out if these creatures exist or not." Is Bigfoot real? We may never know the answer?